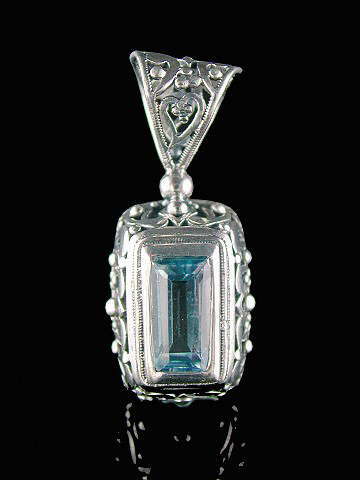 Stunning emerald-cut Blue Topaz pendant set in a 925 sterling silver filigree mount - gorgeous! Topaz is typically found as a beautiful, golden brown to yellow stone, with the latter often being mistaken for Citrine, and vice versa. Blue Topaz is found in nature, but is far rarer. Most of the Blue Topaz available commercially is usually heat treated clear Topaz. Nonetheless, it is still real Topaz and has the same metaphysical properties of the naturally occurring type. It is one of the hardest crystals on the planet, which is one of the reasons why it has been used extensively in jewellery making for thousands of years. It carries a joyful energy and is considered a very lucky stone, attracting good fortune to the wearer. The blue in particular is a stone of spiritual love and peace. It is also a manifestation stone, helping to realize dreams in the physical realm.